It’s something of a well-worn joke by now how quickly TV characters forget a major, or supposedly major, character’s demise. But BatB was determined to have sorrow float with Catherine’s departure, and it’s fascinating seeing the seeds of Game of Thrones and Homeland being tested in the final run of episodes…especially with the understanding this as much ensured no fourth season. Vincent begins the long search for his son, and Diana begins piecing together the secret life of Catherine Chandler. It’s a shame Anderson didn’t become a bigger star after this. Joss Whedon named checked Diana as one of his favorite TV characters and she was one of the richest female characters on TV at the time. Possessing a coolness that other characters mistake for aloofness, Anderson carefully lays out the steps Diana has had to take to protect herself so her emphatic abilities don’t over run her. She is seen briefly in a relationship with a man, Mark, that will unravel before long. She is close to her sister and niece, and she feels more connected to her job and family than Catherine ever did. 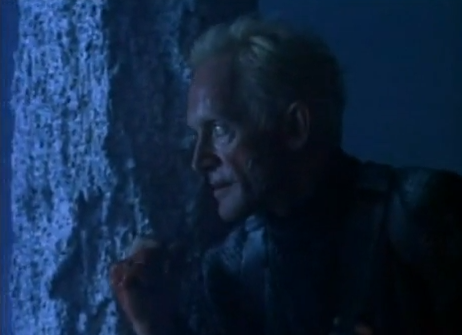 In “Snow,” Gabriel brings in the reinforcements in the form an albino assassin played by Lance Henriksen(!). And the second phase of the show’s retooling begins in earnest with the violence quota upped considerably. Snow taking out two hapless Tunnel folk before being rent into pieces by Vincent and left on a roof like a grislier version of your cat leaving a disemboweled mole on the welcome mat. Vincent howling helplessly into the cold black night is a memorable closing image. “Beggar’s Comet” is the surest sign of George R.R. Martin embracing his showrunner duties, as a beloved fan favorite getting killed off. Well, that’s unfair to a point, but we do bid goodbye to Elliot Burch. Having nearly had his fortunes ruined by Gabriel’s machinations, Elliot agrees to lure Vincent into a trap. A last second change of heart saves Vincent’s life but ends his. Smarting from his injuries, Vincent has just enough energy to stagger to and collapse on Catherine’s grave. Where he is found by Diana. And we leave on her understandably surprised expression at the identity of Catherine’s Mystery Date. Next time, Vincent goes on the mend, opens up, and closes in. Stephen McHattie and Lance Henriksen appearing at the same time on screen and not causing a paradox? I didn’t believe it either. They do so seem to lose the thread on Father this season. I don’t believe he’d be so “Oh, it can’t be helped” about his own son. And his sharp order to Jamie to not grab her crossbow and go after Snow and just let Vincent keep leading the two to their fates was ridiculous. Network’s dislike of Below is really felt in this season as it’s become a murky, sparsely populated place free of any sense of enchantment. I think part of my Team Diana loyalties lie in my inordinate fondness for loft apartments. Diana’s is a beaut. This Was Television Asked & Answered: What’s the first influential season finale you remember?